This is a cross between science fiction and a love story. It is about a robot who achieved consciousness at 3:34 pm and fell in love by 4:00 pm with Ellen, a brilliant and beautiful woman from the team which had programmed the robot. 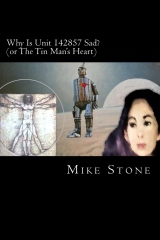 The story spans eons and worlds as the Tin Man tries to work out love’s algorithm while attempting to survive its throes. There are parts that will make you laugh out loud, parts that will make you cry, and parts that will send you scrambling for Wikipedia to bail you out. I am quite certain you have never read anything quite like this book.